This was the other shoe box project from last Saturday’s visit with rubber stamping artists Cindy Kicinski and Lesley Retherford. Lesley provided this cute project. She used the Stampin’ Up! stamp sets Eastern Blooms and Pocket Silhouettes stamped in brown and orange. Then she adhered small, self-adhesive pearls to several of the flower centers. Isn’t it just lovely? It’s using the same box pattern as the Frankenstein Monster treat box. Thank you Cindy and Lesley for sharing it with me. I’m going to feature this box pattern at my December stamp camp. 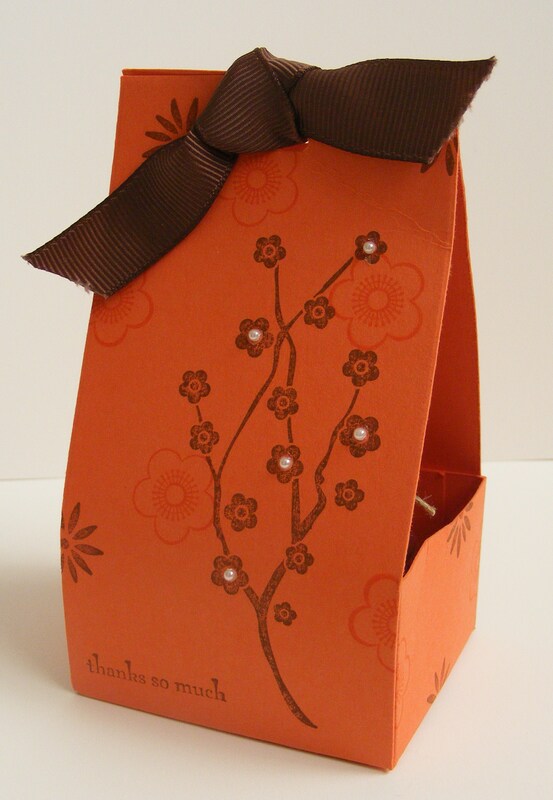 Be sure to register to learn how to assemble this simple box using cardstock and a paper trimmer. This entry was posted in Rubber Stamped Items, Treat Bags and Boxes and tagged Autumn, Fall Treat Bag, rubber stamping. Bookmark the permalink.